Rodman in North Korea for match Jump to media player Retired US basketball player Dennis Rodman has arrived in North Korea along with a team ahead of a match to mark leader Kim Jong-un's birthday. Rodman: 'North Korea is pretty cool' Jump to media player Dennis Rodman has been coaching young basketball players in North Korea, as part of a plan to bring 12 ex-NBA stars to the country for a game. Dennis Rodman defends Kim Jong-un Jump to media player The former basketball star Dennis Rodman has hurled abuse at reporters, as he angrily rejected calls to lobby for the release of an American detained in North Korea. Rodman in N Korea for second visit Jump to media player Retired US basketball player Dennis Rodman has arrived in North Korea for his second visit this year to meet leader Kim Jong-un. Rodman: N Korea 'don't want to do war' Jump to media player Kim Jong-un wants US President Barack Obama to call him, and doesn't want war, according to former basketball star Dennis Rodman. Rodman: Kim is 'a friend for life' Jump to media player North Korea has released photographs of its leader Kim Jong-un meeting retired US basketball player Dennis Rodman. The American basketball player, Dennis Rodman, who is on a controversial trip to North Korea, has sung "Happy Birthday" to the country's leader, Kim Jong-un. 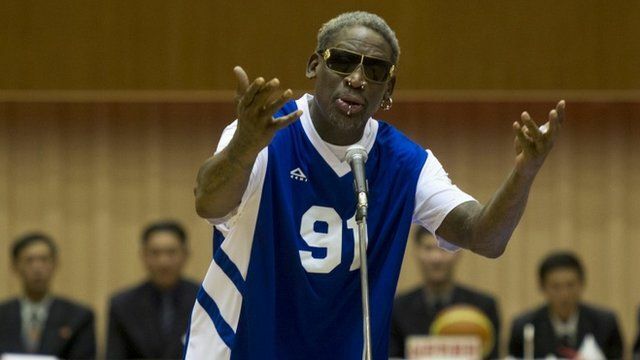 North Korean spectators applauded as Rodman sang the tribute before leading a team of former American basketball stars in a match against a North Korean team in Pyongyang.